Bill C-23, the Preclearance Act, was recently amended by the Standing Committee on Public Safety and National Security and passed to the Senate on June 21, 2017. The bill establishes many new preclearance areas in Canada to be staffed by U.S. officers in order to clear travelers through customs prior to crossing the border. Canadian officials will conversely work in preclearance zones in the U.S. This bill is designed to expand border preclearance, expediting travel and the movement of goods between our two countries. Concerns have arisen with respect to the amount of power granted to U.S. officials on Canadian soil and how their actions will be held accountable under Canadian law. Although many recommendations to rectify the potentially unconstitutional aspects of the Act were made to the Standing Committee, they were insufficiently adopted in the Committee’s amendments. Consequently, if enacted in its current form, the bill will expose border crossers to many potential violations of their Charter rights. Bill C-23 was conceived in 2016 in response to the Agreement on Land, Rail, Marine, and Air Transport Preclearance signed by the Canadian and U.S. governments. It was first tabled in the House of Commons on June 17, 2016, and was referred to the Standing Committee in March of 2017. The Asper Centre made several arguments concerning the bill’s constitutionality in its submissions to the Committee including recommendations to scale back the expanded powers granted to U.S. authorities to question, search, and possibly detain travelers entering the United States. The Asper Centre’s submission focused on three major issues: preclearance officers’ power to search and detain, the protection of digital privacy rights, and the lack of meaningful remedies. The Asper Centre was the only organization to make an argument for increased digital rights protections in preclearance zones. Courts have consistently held that one’s expectation of privacy is significantly diminished at the border, as it is reasonably expected for travelers to be screened. Items such as luggage and purses are classified as “imported goods” and are subject to searches absent reasonable suspicion. The Asper Centre urged the Committee to classify digital devices as distinct from imported goods in order to afford these devices more protection due to the intimate and singular nature they play in our lives. Under the current law, travelers who wish to withdraw from preclearance may do so at any time, no questions asked. Bill C-23 introduces a new process of withdrawal, outlined in s.30, which states that to withdraw from preclearance travelers must answer truthfully to any questions pertaining to their identification or reasons for withdrawing, and must comply with direction given by preclearance officers. The Asper Centre, British Columbia Civil Liberties Association (BCCLA), and the Canadian Bar Association (CBA) all raised issues with this provision’s potential to create a situation of arbitrary detention contrary to s. 9 of the Charter. Under this new legislation, travelers would not feel free to walk away from preclearance, creating a reasonable perception of detention. Each group also discussed several other rights engaged by this provision including: the right to be informed of the reasons for detention, the right to counsel, and the right to silence. Granting U.S. officers the power to conduct strip searches was also a point of contention. S. 22 of the bill affords this power to U.S. officers if Canadian officials are either unwilling or unavailable to conduct the search. Both the BCCLA and the CBA noted that strip searches are prima facie violations of the Charter, and submitted that this power should not be granted to U.S. officers. The CBA recommended that only Canadian officers be allowed to execute strip searches. The Asper Centre considered the power to conduct strip searches in light of the fact that there are insufficient remedies for rights violations within the bill. An unlawful strip search engages s. 8 of the Charter, but American authorities are immunized from any civil claims under the State Immunity Act unless they cause death or serious bodily injury. In order for a psychological harm to be covered it must rise to the level of nervous shock. Further, since U.S. officers are not considered servants of the Crown, Canada could not be held accountable for any rights violations. This potentially precludes remedies in the form of damages, declaratory relief, and any other means deemed appropriate under s. 24(1) of the Charter. While the BCCLA recommended clarification of how the U.S. will be held to compliance, the Asper Centre took this one step further, recommending that the full range of Charter and Canadian Human Rights Act remedies be made available against the US for actions of preclearance officers in the fulfillment of their duties. The other significant addition made to Bill C-23 was the addition of s. 11(2), which states, “The Minister must…provide every preclearance officer with training on the Canadian law that applies to the exercise of the preclearance officer’s powers and the performance of their duties and functions under this Act.” This was an issue that was raised by the BCCLA, which urged that the government ensure that preclearance officers be properly trained so as to prevent violations of Canadian law. The amendments do not address the issues of preclearance detention, digital privacy rights, or strip searches, however. The rights protection concerns in preclearance areas are especially salient due to the current state of Canada-U.S border immigration. There has been consistent coverage in the media of incidents of Canadians being turned away at the border as a result of seemingly discriminatory practices. The Ontario Human Rights Commission recently released a report documenting the impact of racial profiling in a number of contexts, and stories of Canadians having digital devices searched extensively at the border are commonplace in the news. 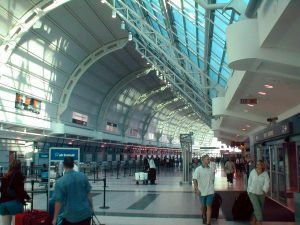 The amendments made to Bill C-23 leave many holes in the protections afforded to travelers in preclearance areas. The current trends are alarming, and this Act will only exacerbate these current issues. Most notably, the lack of remedies available for harms caused by the unlawful actions of U.S. officers leaves their increased powers unchecked, and travelers vulnerable to violations of their Charter rights. Bill C-23 was passed to the Senate on June 21, and will hopefully be met with some rational objections. This entry was posted in Commentary, Legislation and tagged Bill C-23, border, Charter, legislation, preclearance, travel. Bookmark the permalink.